Xinyi Road, Taipei, a photo by david.jack on Flickr. 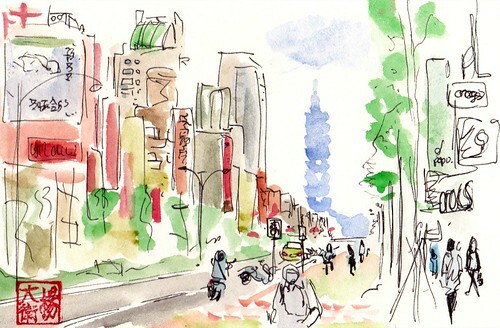 Sketch of Xinyi Road in Taipei. I had some minutes to kill waiting for my wife before having lunch. I like Xinyi road, you can see the impressive Taipei 101 on the background, that was for some years the tallest building on Earth. It's also a very colourful street, and I wanted to insert those colours on my sketch. Dibujo de la Carretera Xinyi en Taipei aprovechando unos minutos mientras esperaba a mi mujer para irnos a comer. 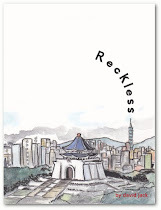 El impresionante Taipei 101 se puede ver en el fondo, durante unos años fue el edificio más alto del planeta. Es una calle muy colorida y queria expresar ese color en mi dibujo.